Since mid-September, we have been hunting a problem that occurs for our Thunderbird users when they attempt to send email via the Office 365 mail server. It seems to be limited to just those using the ExQuilla plug-in, which gives access to messages/contacts on the Exchange server. The symptoms are that in the body of the email, words will be run together without spaces between them. It's not every word, but rather every 10th or 12th word where the spaces will be dropped. The underlying cause of this seems to be a known issue at ExQuilla. Beginning about September 17, 2015, we started receiving reports from ExQuilla users who used Office365 as a server, that sent emails have all line breaks removed, which appears as an issue to both the recipient as well as in the Sent Items folder. You can also see this bug in action if you go to your "Sent Items" folder in Thunderbird, under your account that uses the ExQuilla plug-in. 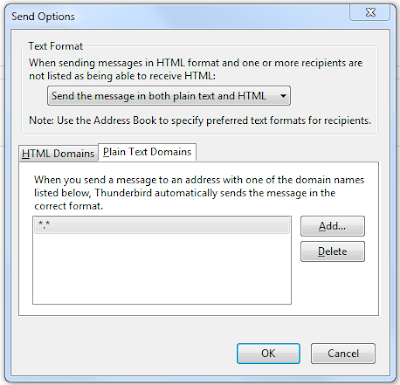 Messages which were affected by the bug will have spaces missing in the copy that was saved to the "Sent Items" folder. Now, other users have suggested a few workarounds to the issue, some of which are a bit tricky to implement, or require action to be taken on every single sent message. Go to the "Options" dialog. Go to the "General" tab under "Composition". Click on the "Send Options..." button. Make sure that the "Text Format" option says "Send the message in both plain text and HTML". Under the "Plain Text Domains" tab, add an entry for "*.*". After that, you should be free of the line-break bug that was introduced to the Office 365 environment. Update 2015-10-01: The problem has supposedly been fixed on the Microsoft side. I'll have to do some testing to see whether it's gone for us. Another user has now reported that a problem which used to exist has now disappeared due to a server update on Office365. If you are experiencing this issue, it will probably go away on its own when Microsoft updates the server.